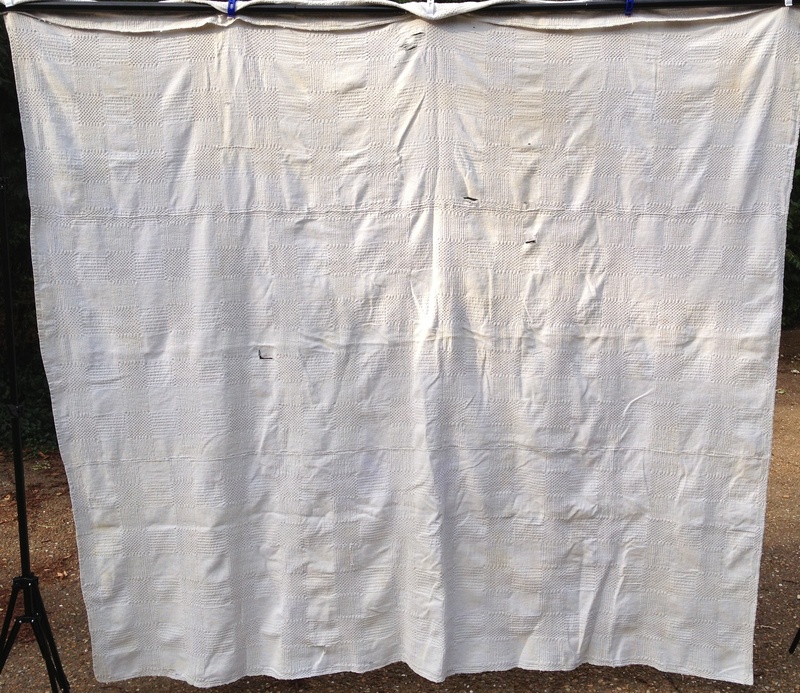 I found THREE antique whitework coverlets, also known as counterpanes, recently. Two of them are embroidered, and one is a double-woven piece that is sort of mind-boggling in its complexity. I’ve looked up everything I can find on the Internet (I love the Internet!) and can’t find much about them, except that they’re probably from the early 1800s. Oh my goodness! How could I find something that precious and old in a little thrift store? I assume they are from the same family, and possibly by the same hand. One of the coverlets is signed, “Susannah Taboy” and the “s” characters are turned backward. Maybe done by a young Susannah. The double-woven piece was in the worst shape, with several breaks in the fabric and stained from improper storage in a cedar chest. 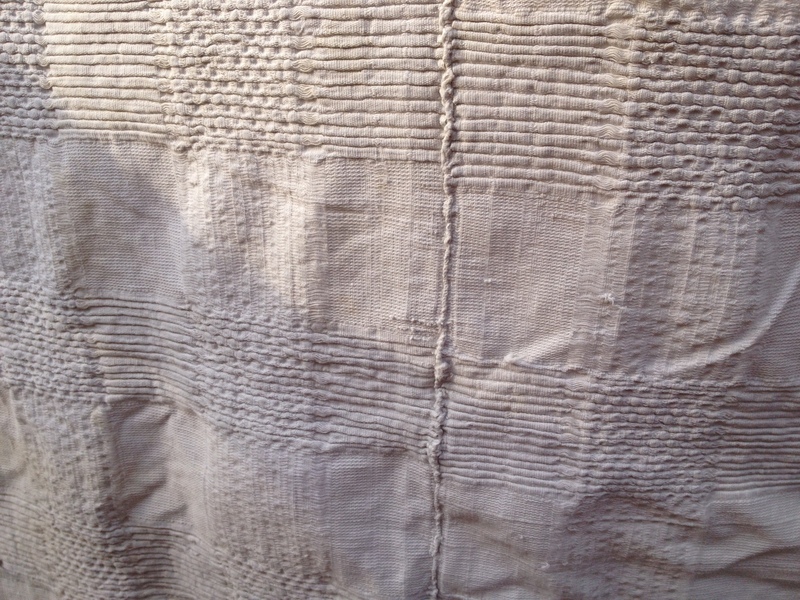 (I’ll lecture about antique linen storage in another rant.) I soaked it and soaked it and soaked it some more–until I felt like I couldn’t get much further along in the whiteness scale, and I feared ruining the poor thing by trying too hard to save it. There are numerous breaks in the fabric, and I will try to fix those. The piece is comprised of three panels sewn together. I can’t believe someone would basically throw these away. What a thrill for me to find them. 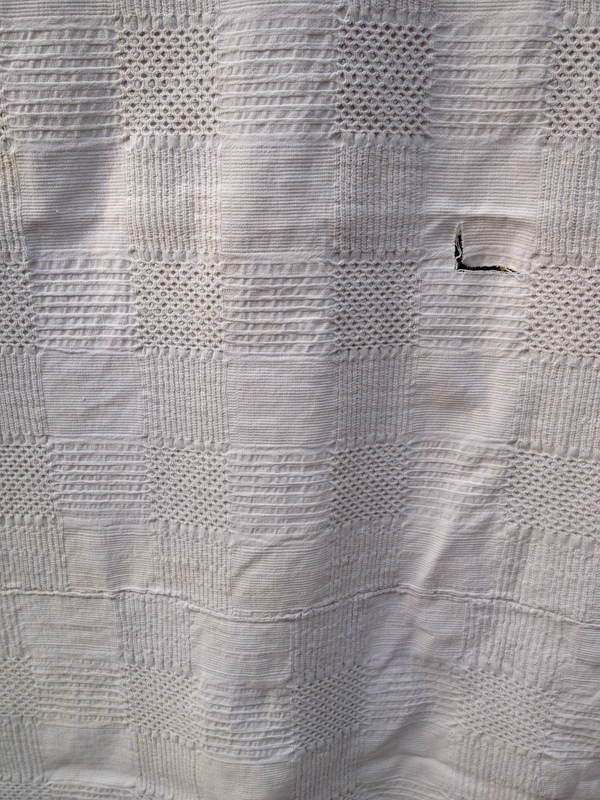 Do you know anything about 19th century whitework coverlets/counterpanes? I’d love to hear from you! I’ll post the other two later. Stand by. Hope you can see the detail in this. I found this quilt on my birthday(!) about four years ago in a very unlikely junk shop just outside Springfield, TN. It was wadded up and stuffed in a corner, and when I opened it up, it just took my breath away. I felt really lucky to have found it and rescued it. When I realized how old it really was (when I got it out into the light) I felt that it needed to be in a setting where it could be respected and enjoyed, which means not in my house, where the stuff that’s used is really used. 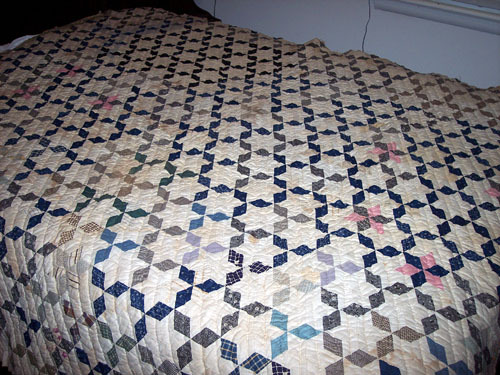 I wasn’t sure if or how to wash it, or if it should be bound and finished, or used as is, or stored along with the umpteen other quilts I’ve “rescued” through the years. The work in this quilt is just amazing…tiny, tight little stitches and perfectly matched points. About a jillion points. It dates from about 1880 and has wool batting. The fabrics include some copper rollerplate prints from the 1830s or so, and lots of indigos. It sold this week to a buyer in Minnesota. I hope she loves it. Rescued from a junk shop!